At Monmouth Pain & Rehabilitation, we never give up when it comes to treating even the toughest cases of back pain—and neither should you. With a long list of non-surgical back pain management options, let Monmouth Pain & Rehabilitation be your first and only stop in the quest to end pain back. At our Lacey, Wall, Freehold, and Shrewsbury offices, it’s truly our passion to help patients find an end to pain without surgery or long-term painkiller usage. With so many treatment options, it’s time to stop accepting back pain as a normal part of the aging process or as the expected result of certain activities. Long-term, debilitating pain is never normal or okay. At Monmouth Pain & Rehabilitation, we find it unacceptable that rehabilitation is often a stressful process—we have put an end to this aspect of care by incorporating all treatment options in one office. We also recognize the overwhelming statistical fact that back surgeries are often ineffective or unnecessary, while painkilling medications are a dangerous long-term solution for pain. We’re doing things differently here at Monmouth Pain & Rehabilitation, and for good reason: our system works. Feel free to read some of our patient testimonials and witness for yourself our success rate. For more information or if you’d like to schedule a FREE consultation in our Lacey, Wall, Freehold, or Shrewsbury office, either call us at 732-345-1377 or fill out our form below. Don’t let pain be a part of YOUR life! In an ideal world, back pain would not exist. Or, one might wish that all cases of back pain could be resolved through physical therapy and chiropractic care (with a little acupuncture added for pain relief). And for some patients, this type of care is exactly the ticket for providing long-term relief from back pain. Other patients are not so fortunate. For some, severe pain may stop the rehabilitation process before it even starts. When back pain is immobilizing, it’s not only life-altering and demoralizing, but it may also make physical therapy or other practices impossible. It is our unwavering goal to help patients find relief from pain and to rehabilitate with the most conservative, least damaging options possible. We want you to use therapeutic exercise and chiropractic adjustment to get better. One way that Monmouth Pain makes this possible is through the use of long-lasting steroid (corticosteroid, or cortisone) injections. The most common of these is the Epidural Steroid Injection. 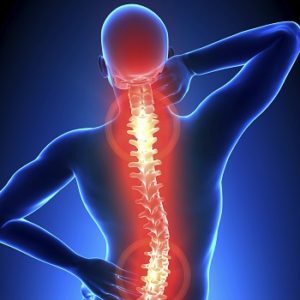 By providing long-lasting, localized pain relief, Epidural Steroid Injections often make the impossible possible—they allow those with disabling back pain to move again and to begin the rehabilitation process. Epidural Steroid Injections are administered in our Shrewsbury, Freehold, Wall, and Lacey NJ pain management office. Click here to learn more about Epidural Steroid Injections in Monmouth County. • Coccyx Injections are used for pain associated with the tailbone. Speaking very generally, back pain is usually caused by age, disease, trauma, or some combination of these factors. For example, a young athlete may incur a minor sports-related trauma that results in an easy-to-treat case of back pain. That same injury might cause an older person much worse pain and disability. Inactivity and obesity can also cause back pain, as can long-term postural issues, everyday activities (such as sitting at a desk or repetitive motions at work), and certain illnesses. Essentially, doing too much or doing absolutely nothing at all can cause back pain. Just getting older may be the culprit. As a symptom, back pain rarely exists in a vacuum; it is often accompanied by a host of other sensations. These may include unpleasant symptoms in the arms, legs, or neck (depending on which part of the back is affected). For example, lower back pain sufferers may also experience ‘shooting’ pains in the leg, leg weakness, numbness, tingling, and other abnormal feelings in the lower extremities. If you are suffering from any condition that causes back pain, feel free to contact our Monmouth County back pain rehabilitation office. Our pain management facility is located in Shrewsbury, Freehold, Wall, & Lacey NJ.